You can share information within your company in many ways: emails, paper memo or publish a document to your portal. A Blog in SharePoint is the best way to give up-to-the-minute information. Nothing really compares to a good blog. It’s a bit like reading a book with really short chapters. Your Newsfeed has a link to your own personal blog. Clicking that link actually does just that — it creates your very own blog site with an entry that lets everyone know to stay tuned to hear from you. Your blog is provisioned when you first click the Blog link on your Newsfeed page. 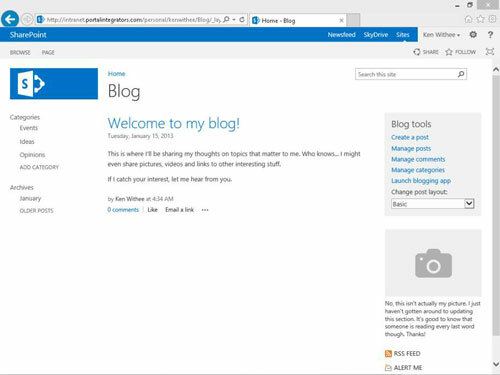 The direct URL to your blog is configured based on how the My Sites functionality was set up in SharePoint. Your blog posts show up on your Newsfeed and the Newsfeed of anyone following you. Your blog site contains some useful links. You can use Categories on the left side and a link to add a new category. You can also use an Archives section that shows you past months. This makes is easy for readers of your blog to navigate through and find topics of interest. You also have links to the blog tools. Here you can create, edit, and delete posts and manage comments that people make on your blog. So what is so special about a blog? Nothing, really, except for the content you create in it. Blogging is not for everyone, but if you feel like sharing your thoughts with your colleagues, and you know that you can post at least a few times a month, your blog might be compelling to your coworkers. Writing in your blog is a great way to communicate what you’re working on, your ideas about the latest company initiative, or what’s going on in your life that you think others may find interesting. The topic of your blog can be about a single thing or can range from the Amazon to Zambia. It doesn’t really matter (unless you start violating some company blogging policies), but what matters to your readers is that you create posts that are interesting to read and you’re updating your blog on a somewhat regular basis.